When people here the name Alexander Ovechkin a highlight reel of goals flashes through their mind. Since coming into the NHL in 2005 Ovechkin has given both Washington Capitals' fans and NHL fans around the world some of the most dominating offensive performances in recent history. There is also a hot debate surrounding Ovechkin. When ever a hockey fan mentions Ovechkin there is sure to be a person near by that will shout Crosby right back. Many say Crosby is the best player in the game, many say Ovechkin is the best player in the game. Here are some points if you're ever locked up in a team Crosby, team Ovechkin argument. In four of his six season in the NHL he has surpassed the 100 point mark, hitting 112 points in the '07-'08 season. He has appeared in 475 games, scoring 301 goals and assisted on 313, totaling 614 points. In his career he has scored 52 game winning goals, that's clutch if you ask me. One of his game winners came against the New York Islanders last season in overtime. 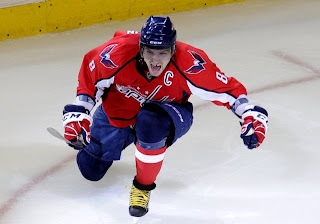 After Ovechkin picked up the puck in his own zone he elected to take the puck himself. He crossed over one New York Islander defense man in the neutral zone, and then fended off a back check from that very same defense man before pulling the puck to the inside, and roofing a backhand shot past the Islanders' goalie. Cue the token Ovechkin fist pump, big cheesy smile, and jump into teammate celebration. Gotta love Ovechkin celebrations. Oh and one more point for the Ovechkin versus Crosby debate, Ovechkin throws hits and Crosby gets concussions. That is all.